If you love white chocolate, Oreos, and cookies and cream anything, but want to indulge in something a little on the healthier side — sans the excess white sugar and artificial ingredients — you’re in the right place. 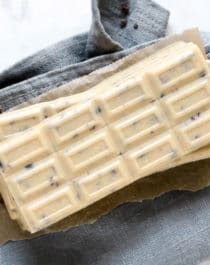 Just like the store-bought version, these Healthy Homemade Cookies and Cream Candy Bars start with a smooth, creamy, and sweet white chocolate base, which is studded full of crunchy chocolatey bits throughout. Every bite is heavenly bliss. You’d never know it’s sugar free, low carb, and keto too! You’ve got flavor. OH SO MUCH FLAVOR)! You’ve got sweetness (HECK YEAH)! You’ve got texture (UGHHHH I’M DYING, I’M DYING, I’M DEAD)! This is one of my favorite treats I have ever made. I kid you not. Over the last 7 years that I’ve been blogging, wow, this is way up there in my all-time faves. The white chocolate and crunchy chocolatey bits work so well together. Fill the bottom portion of a double boiler with 2-3” of water. Make sure the water doesn’t touch the bottom of the double boiler insert! Place over a stove set to medium heat. While the water heats up, add the macadamia butter, cacao butter, and vanilla paste into the double boiler insert. When the water starts to simmer, reduce the heat to medium-low. Whisk occasionally until completely melted. Turn the stove off. In a small bowl, whisk together the erythritol, dried milk, and salt. Slowly whisk into the stovetop mixture. Whisk in the stevia extract (it will thicken). Spoon the mixture into chocolate bar molds. Refrigerate until firm. Store in a tightly sealed container in the fridge for up to 2 weeks. Recipe adapted from the Homemade White Chocolate recipe in the Naughty or Nice Cookbook. Sugar, Vegetable Oil (Palm Oil, Shea Oil, Sunflower Oil, Palm Kernel Oil and/or Safflower Oil), Nonfat Milk, Corn Syrup Solids, Enriched Wheat Flour [Flour, Niacin, Ferrous Sulfate, Thiamin Mononitrate, Riboflavin, Folic Acid], Lactose (Milk), Cocoa Processed with Alkali, Whey (Milk), High Fructose Corn Syrup, Chocolate, Soy Lecithin, Baking Soda, Salt, Natural Flavor, Artificial Flavor, Tocopherols, PGPR. Keep these delicious chocolates around for a midday treat or party snack, or to add into your favorite dessert recipe. Enjoy! I love cookies n’ cream! These bars looks so delicious! Wow!! These bars look perfect!! I need these for S’mores 😍I love that they are healthy! I have NEVER EVER known of macadamia butter. Dang now I need to find it! These bars look scrumptious. I had NO idea these bars were dairy free and healthy–they look JUST like the original cookies n’ cream bars!